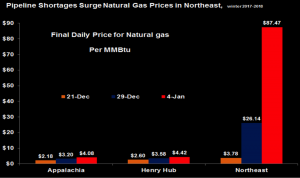 Natural gas prices in some parts of the Northeast increased by 60 to 70 times their recent rates because there is insufficient pipeline capacity in the region during periods of high demand spurred by cold weather. The recent cold weather system stressed the market as much as the polar vortex of 2014. Natural gas is increasingly being used in the Northeast for both heat and electricity, providing over half of the electricity in the region. To make matters worse, the region has shuttered coal-fired and nuclear power plants that provide reliable power. Due to bad policy, annual residential electricity rates in the Northeast average about 19 or 20 cents per kilowatt hour, compared with the national average of 12 to 13 cents. 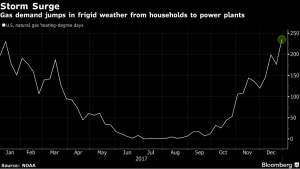 But due to the cold front experienced during the first week of January along with the so-called bomb cyclone, electricity prices rose 126 percent to $273.23 a megawatt-hour and natural gas prices rose to $87.47 per million British thermal unit on January 4. New England’s energy woes are the result of state and federal policies aimed at closing coal-fired and nuclear power plants. For example, the Brayton Point Power Station, New England’s largest coal plant, was shuttered over the summer. New England currently generates about 3 percent of its electricity from coal—down from about 18 percent in 2000. With the cold weather, however, coal plants are generating about 6 percent of New England’s power. As of the afternoon of January 3rd, natural gas was producing less than one-quarter of the region’s power, oil accounted for a third, and nuclear was 29 percent. The shuttered coal plants have largely been replaced by natural gas plants. But pipeline capacity has not kept pace. In November, the Independent System Operator for the region identified 4,000 megawatts of natural gas power capacity “at risk of not being able to get fuel when needed.” While New England’s power grid operator predicted they would have enough energy supplies to meet demand this winter, they admitted there could be problems due to record-low temperatures. Environmentalists have contributed to the problem by protesting pipeline projects. Further, the Massachusetts Supreme Court ruled companies could not enter into long-term gas contracts and pass those costs onto consumers. Utilities Eversource and National Grid had to withdraw their plan for a $3 billion pipeline that would have brought natural gas to New England. The $3 billion Access Northeast pipeline project would have expanded an existing New England pipeline and was expected to save customers $1 billion a year. A second $3 billion proposed pipeline, the Northeast Energy Direct project, was mothballed in 2016 due to political resistance. New Yorkers can thank Governor Cuomo for their energy prices during the bomb cyclone for his decisions to ban hydraulic fracturing operations and his refusal to provide permits for natural gas pipelines to bring natural gas from the Marcellus Shale in Pennsylvania and West Virginia. New York generates over 40 percent of its electricity using natural gas, and more than half of the state’s residents heat their homes with the fuel, which in other U.S. regions is abundant and inexpensive. 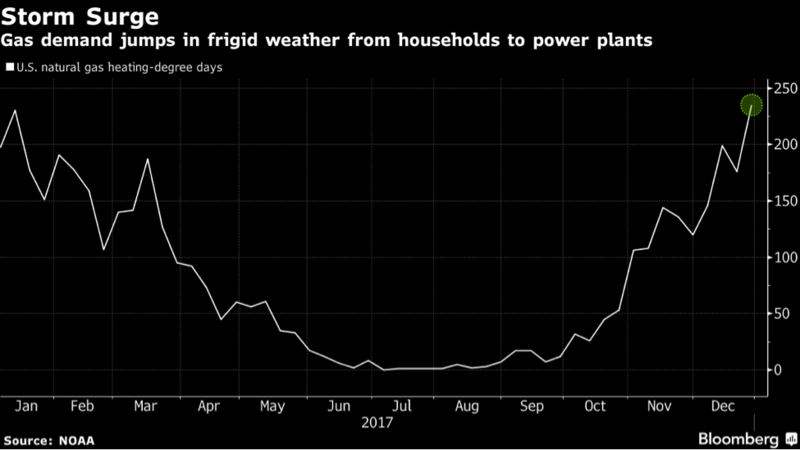 Spot prices for natural gas reached a record $175 per million British thermal units in New York—60 times higher than the $2.93 that U.S. gas futures have been averaging on the New York Mercantile Exchange this winter. Cuomo’s decisions affect New Englanders as well for it is impossible to construct a pipeline to move natural gas from the Marcellus region to New England without going through New York. The U.S. Chamber of Commerce issued a report early in 2017 quantifying the cost to New York and the New England region of Cuomo’s decision. According to the report, residents of the Northeast pay 44 percent more than the national average for electricity and 29 percent more for natural gas, and regional manufacturers pay 62 percent more for their electricity than the national average. Without building new pipelines, New York would lose 17,400 jobs, $971 million in labor income, and $1.6 billion in economic benefit by 2020. The Northeast region would lose 78,000 jobs, $4.4 billion in labor income, and $7.6 billion in gross domestic product. 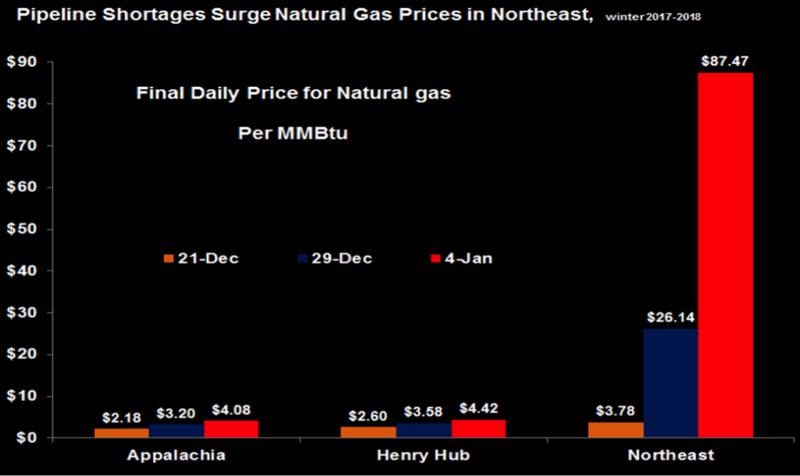 Bad policy decisions regarding limiting pipeline capacity, banning hydraulic fracturing, and shuttering coal and nuclear power plants have caused natural gas and electricity prices to spike in the Northeast when the bomb cyclone hit. As Energy Secretary Rick Perry said, “What is not debatable is that a diverse fuel supply, especially with onsite fuel capability, plays an essential role in providing Americans with reliable, resilient and affordable electricity, particularly in times of weather-related stress like we are seeing now.” Bad decisions can have bad consequences, and the recent cold weather is proving that for consumers in the Northeast.